Synopsis: In the remote Andean village of Colibrí, a boy discovers what appears to be the body of an angel. But in the face and wounds of the dead, winged woman, Dr. Gregory Moreno sees something even more disturbing: an uncanny resemblance to his beloved late wife that cannot be mere chance. And in American anthropologist Sophie Lawson, still more echoes of the doctor’s lost love stir…igniting the superstitions of the townspeople, and an elusive killer’s deepest desires and despair. Review: Sophie and her son Finn stumble upon the small town of Colibri while on vacation. Despite laws against it Colibri still holds mysterious ceremonies to appease the gods. 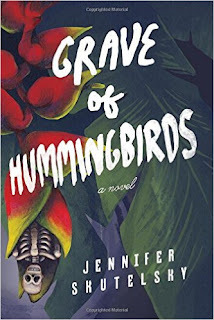 Finn seems to have a mysterious connection to animals and Sophie resembles two women who have both died mysteriously in Colibri. Both start to feel uncomfortable and want to leave Colibri but find themselves being kept there like they are lead actors in a play not of their choosing. There is a lot of folklore and small town mystery, intrigue and superstition in this book, reminding me a lot of Isabelle Allende's work. Ghosts and secrets abound leaving you often wondering what exactly is real. This story is very atmospheric and lyrical. Several of the characters are very well developed and others we get to know enough to carry us though. This small town seems to be straddling their present and their past traditions, they seem to need to let go of the past in order to move forward but struggle with letting go. I really loved this book and found the feel of it to be very fable like also reminding me of the works of Paolo Coehlo. The ending was surprising and satisfying even though it left me wanting a little more. The title is a little confusing I feel like it should be Grave of the Condors not Hummingbirds which barely make an appearance.